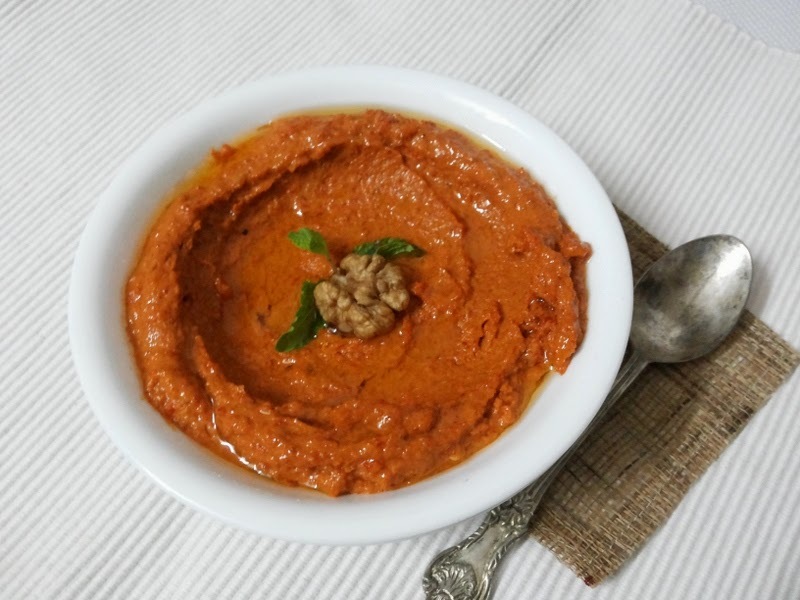 Muhammara is a red pepper and walnut dip which originated in Syria. 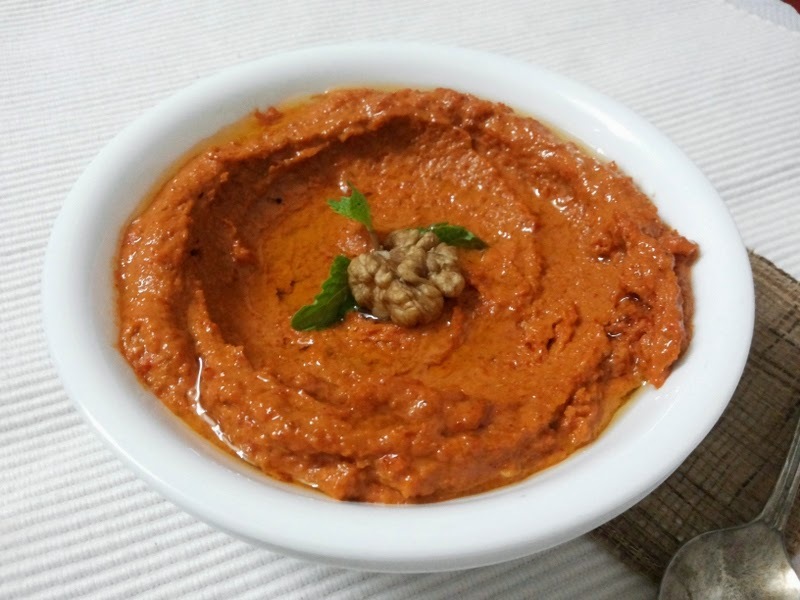 It is one of the most popular dips in Middle Eastern Cuisine. This is a very simple dip and one just has to blend the ingredients to a paste. Now you have the choice to make the paste smooth or chunky, the taste is as awesome. We all are fond of these Middle Eastern dips. 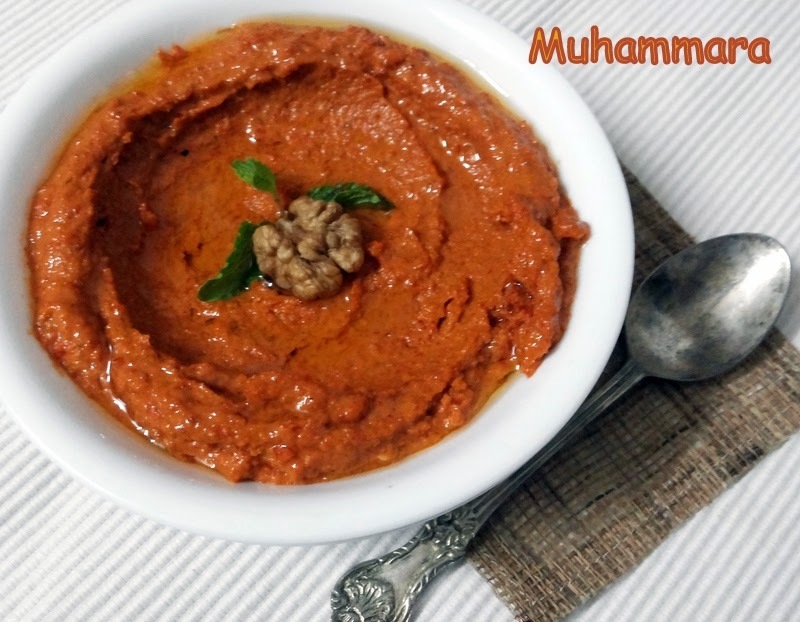 I have been making hummus which is the most popular dip from Middle East, but had never tried Muhammara. The mezze platters are incomplete without this dip.This is my post for the BM # 48 Day 1 under Middle East Cuisine. Roast the bell pepper on slow fire till completely charred. Scrape off the charred skin. Wash the pepper and chop it roughly. Blend the bread crumbs in a food processor, adding a little water and making a purée. Sauté the onion till golden. Now add these onions to the bread crumb puree . Also add the walnuts, pepper,chilly powder, cuminseeds, lemon juice , salt and olive oil. Blend it to a smooth paste adding olive oil as needed to get the right consistency. Serve as a dip with pita, wedges, chips or as a spread over a toast. It can also be served as a sauce with kebabs.